FOUR industry professionals spoke about the big stories of 2018 and the challenges they face, during the annual NCTJ conference at Harlow College. 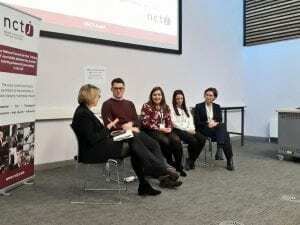 Branwen Jeffreys, education editor at BBC, chaired the panel alongside journalists Alex Marrow, Rebecca Hudson, Stephanie Finnegan and Sarah Whitehead. Stephanie Finnegan, court reporter for LeedsLive and ExaminerLive, shared her experience when reporting on the Tommy Robinson case earlier this year. Panel journalists L to R: Branwen Jeffreys, Alex Marrow, Rebecca Hudson, Stephanie Finnegan and Sarah Whitehead. Stephanie was subjected to online abuse after publishing an address associated with controversial far-right activist Tommy Robinson. Extreme cases of her online abuse included trolls stating that they hoped Stephanie was raped and murdered. Other panelists, Rebecca Hudson, of the Salisbury Journal and Sarah Whitehead, deputy head of news gathering at Sky News, also spoke at the conference. They covered issues including the Salisbury Novichok poisoning and the Royal Wedding.